Our standed rooms are the perfect combination for couple's. The Coffee-shop offering Buffet Breakfast, Buffet Lunch, Buffet Dinner as well as a la-carte menu and Snacks at the lobby level. Indian/South Indian and Continental Items with live counter. Variety of veg main course. Desserts Sweets, Fresh Fruits & Ice Cream. Non Veg Dinner Buffet - 07.00 pm - 11.00 pm. Monday to Saturday Rs.575/- + GST, Sunday Rs.650/- + GST. Variety of veg & Non-veg main course. The Best hotel in Vizag with fantastic interiors. Awesome Hospitality. Front office welcomed us with a big smile and check-in & check-out was very quick. We enjoyed our stay & food in HORIZON restaurant. 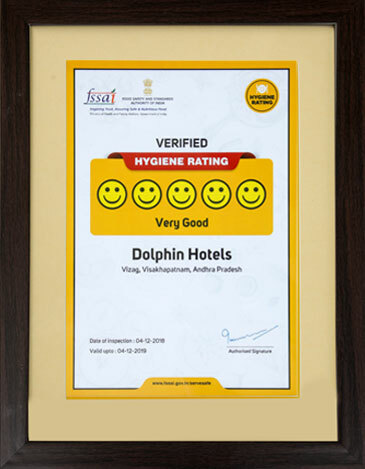 The entire staff is highly courteous & caring. My daughter thoroughly enjoyed the complimentary toffees, fruit bowl. Overall worth staying. Really nice hotel. Convenient location. I had a pleasant experience. Staff are very good and polite.